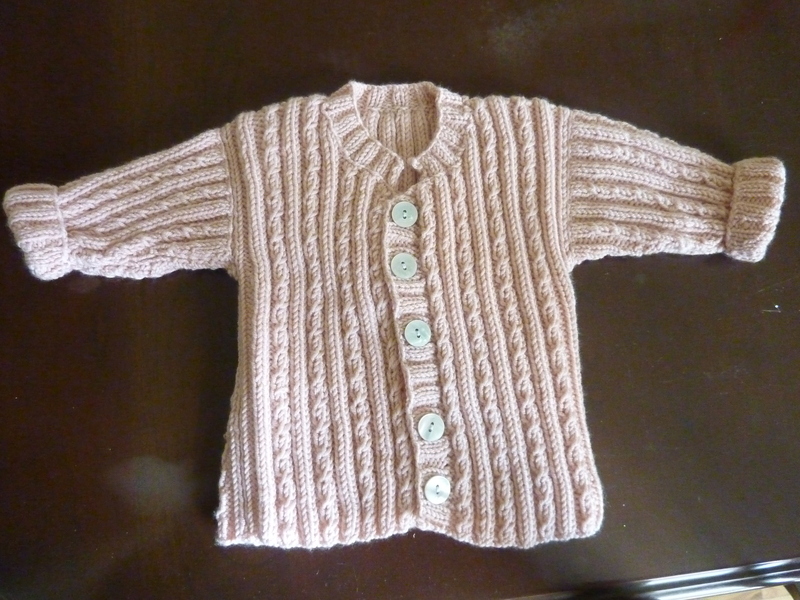 Okay, Baby Katie — here’s your sweater. Now, where are you? We spent a few evenings last week taking walks around various indoor locations (the State Capitol building, Trolley Square) in order to get contractions going. At Trolley Square, the kids ran into Pottery Barn Kids and then immediately began to beg . . . for things for Katie. Jeffrey spent a good half hour in the baby girl bedding section, giving serious instructions about how we needed the beaded lamp, the rocking chair, and the matching butterfly bedding set. (Had he forgotten that we already have the nursery pretty much ready?) “Excuse me, madam,” he asked a sales clerk, and held up a pink bunny blanket. “Is there a way we can buy this but put Baby Katie’s name on it first?” Of course, the clerk replied, and then nattered on about online purchasing while I tried not to sigh. Pottery Barn exists in a parallel sales universe that subsists on a healthy mix of the rich and gullible. That bunny blanket retailed at $30. Diaper bags were $168. It’s cute but insane, right? Eleanor, meanwhile, fell in love with the canopied little girl beds. “When Katie turns five like me, we have to get her one of these, Mom. Please please please?” Oh, thank goodness I have five years to go. A tepid “we’ll see” satisfied her completely. In the meanwhile, I’m getting all kinds of tiny contractions, bizarre advice about how to induce labor (apparently rubbing my heels with my thumbs can do the trick) and the kids are obsessed with watching the documentary Babies. Little Katie, where the heck are you? It’s time! About six weeks ago Brian and I took the kids on a popular hike up Little Cottonwood Canyon to a place called Cecret Lake. Alpine spring was at its peak; as Eleanor put it, “Mom, there are dillions of flowers here!” The trail was busy, but the lake was still peaceful. Jeffrey had fun watching some other kids catch salamanders. But, on our way back down, the weather changed from sunny to cloudy, and it began to rain. As we scurried to take cover under some trees, Jeffrey turned back towards me. “You’d better keep that BABY warm!” he shouted, all concern. Jeffrey wasn’t worried about William, but the baby in my tummy. For those of you who haven’t heard, I’m expecting a baby on January 19. Yes! Number four, our winter baby (since we’ve already had spring, summer, and autumn babies). We just found out this week that it’s a girl! Eleanor was so excited that she hopped up and down at the news. “Mom, don’t worry, I know all the best baby games, like Peek-a-Boo and This Little Piggy,” she said. I’ve been feeling fine — oddly, I haven’t experienced much morning sickness with this pregnancy, just extreme fatigue. (My current motto is “Napping Towards Glory.”) Although most of my summer was spent crumpled up in a state of continual exhaustion, I suppose I’d rather get hit with the Fatigue Stick than the Nausea Stick, anytime. My attitude towards the baby is kind of mixed — I’m happy and excited to have another person in the family, but I dread, dread, dread that first year of infancy. I had recurring breast infections with all three of my other kids, and I was just getting used to not having to drag a stroller with me everywhere I go. Augh, and doctor and dentist appointments. I won’t be able to do them during the daytime anymore. But let’s not ruminate on this stuff. A baby girl is a great thing to snuggle, cuddle and watch grow. This is what I wanted — I certainly had to jump through enough medical hoops (what with my heart and all) to get this far. Enough with the whining. Unless she’s a blonde. Then I won’t have the foggiest idea what to do.